Minta's Creations: Check this out Minecraft fans! Check this out Minecraft fans! Wow!! now this is something that my son would love and for all Minecraft gamers!! I know my son spends hours at a time playing with his friends online!! He will be ecstatic not to mention that I will be mom of the year to take him to this!! I think I'm going to surprise him so I'm telling everyone now that this would be amazing to take your kids to. Check here superleague.com to find a theater near you!!! I'm super excited to have this opportunity to take my son! Bring your laptop with Minecraft 1.9.2 installed and play first-person on your computer and then you wirelessly connect to Super League’s server which puts you and everyone else in the movie theater’s gameplay up on the big screen. 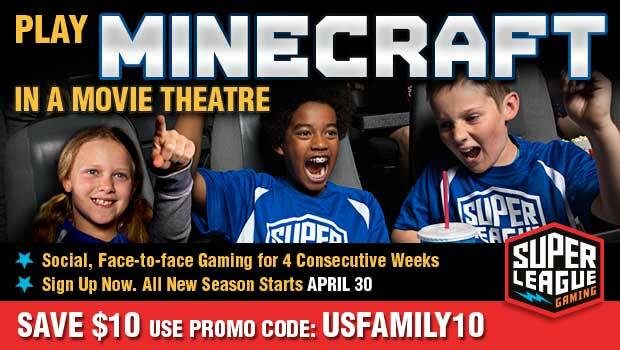 Parents and siblings can attend for free to watch and cheer their gamer on. It’s all about teamwork and collaboration. Each player gets a free gaming t-shirt encouraging team building and camaraderie. There’s even an opportunity for the winning team to evenly split a college scholarship. League starts April 30. Visit Superleague.com for a schedule of times and locations. Tickets are regularly priced $60. Use promo code “USFAMILY10” today for an exclusive $10 discount. Did you know that you can shorten your links with AdFly and earn cash for every visitor to your shortened links.